Ultra DI liquid particle counters are designed specifically for (deionized) DI water systems and will count and size contaminants as small as 0.05 microns (50 nano). The Ultra DI's large sample volume, low zero count, and high counting efficiency provide unsurpassed performance. What are some typical particle distributions for particle counters? Learn more about our microcontamination monitoring services. The table below shows how the sample volume rate differences between liquid particle counters affects the time needed to measure a specific volume of fluid. If the particle concentration is 0.5 particeles/mL, only 20 particles will normally be detected in a 40 mL volume. This liquid particle counter is CE certified. 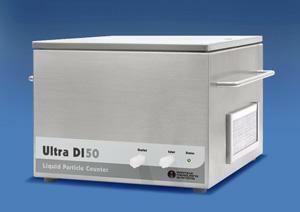 Ultra DI® is a registered trademark of Particle Measuring Systems, Inc. Patents and applications apply - US 4798465; Japan 2786187; Germany 3712665C2; US patent pending.